Andrew Schlesinger caught in the act of investigating Vaughn Bell's suspended greenhouse installation, Village Green.Every environmentalist brings their own unique perspectives and education to approaching environmental and climate-related issues and challenges. Environmental engineers work to develop solutions for adapting to living in new climates, environmental writers translate hard science into more easily comprehensible articles and environmental artists adapt scientific evidence into art pieces that speak clearly and strongly to environmental changes around us. Each environmentalist works to better understand their natural world — their work attempts to better inform their family, friends, and communities about the tangible and intangible changes around us. Sensing Change, The Chemical Heritage Foundation’s (CHF) climate-related art exhibit, works to improve upon the disconnect between chemists, artists, and audience. On display in CHF’s Clifford C. Hach Gallery from July 2013 through May 2014, the exhibit features an array of interactive art from artists Vaughn Bell, Andrea Polli, Diane Burko, Roderick Coover, Katie Holten, Stacy Levy, Eve Mosher, Fernanda Viégas, and Martin Wattenberg. Together, these artists investigate, observe, and translate the chemistry and complexity of our climate and environment through unique medias. Each artist brings their own distinct environmental background and interests to the table, creating a multi-dimensional art exhibit that connects viewers to everyday phenomena in new and innovative ways. The idea for Sensing Change emerged two years ago when CHF’s Associate Director, Jody Roberts, mulled over the idea of creating an interactive, chemistry-based exhibit, while he waited for a train with a friend. Over the last two years, idea has blossomed into reality and the exhibit has emerged as an innovative environmental education destination for Philadelphia. Sensing Change includes a diverse array of mediums which collectively translate scientific data into installations for audiences from all backgrounds to comprehend. Among the exhibit’s installations, Andrea Polli’s Particle Falls, offers a real time visualization of air quality data in San Jose by capturing the visual aspect of particulate pollution as a positive and educational art piece. Fernanda Viégas’ and Martin Wattenberg’s Wind Map, offers a computer scientists account of the current wind patterns across our country. This map makes wind visible and offers visual representation of these patterns in flux as ocean temperatures change and winds shift in the Anthropocene Age. Other installations include Stacy Levy’s, Calendar of Rain, is an ongoing visual record of daily precipitation captured at the CHF, recording 365 days of precipitation from May 2013 to May 2014. 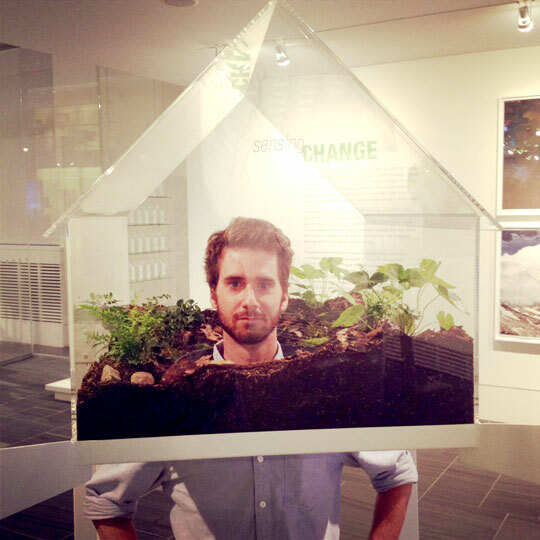 And Vaughn Bell’s, Village Green, offers two interactive suspended greenhouses that allow visitors to pop their heads inside the structure to experience a worm’s-eye view of the plants within. The two greenhouses allow people to experience entering small ecosystems, reminding us of the many ways we can interact with and connect to our landscape. Sensing Change is officially open to the public and should be enjoyed by everyone in the Greater Philadelphia region. The exhibit is free and exhibition hours run from 10am - 5pm, Monday through Friday. For more information on the exhibit and all of its installation’s, visit the Sensing Change Exhibition website.